Sporturf™ is still the leading synthetic turf surface company in the world. Our in house, state-of-the-art laboratory provides us the ability to develop products that exceed the requirements of all the individual sport’s governing bodies around the world. 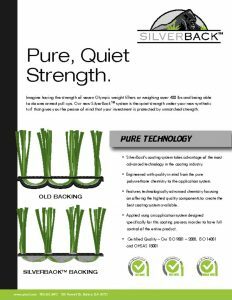 With that comes the knowledge and capability to have one of the best backings on the market, Silverback™. The components that make up Silverback™ are simple. It is, at its core, a heat activated polyurethane with zero vegetable-based polyols, forming the best polyurethane backing available in today’s market. When you have Silverback™ as your backing, you know you have the quiet strength required by today’s consumers, regardless of the application. So if you need turf that is going withstand a beating, with the science and quality to back you up then Sporturf™ is what you need.